This year is full of endings, so many that 2019 is even being referred to as the Year of the Finale. We get one out of the way right in January, though it's not one would have been on people's radars even a year ago. The Career Resurrection of M. Night Shyamalan (How's He Going To Blow It This Time?) is one of the more intriguing and unlikely subplots of the last few years, with the past wunderkind of directing going from world beater to punchline to box office poison to maaaybe? viable again? I'm not quite sure we're ready as a culture to respect him again, though he's at least trying to meet us halfway. Glass supposedly wraps up the bow we didn't know was being tied, which started all the way back in 2000 with Unbreakable, his lo-fi superhero film with Bruce Willis and continued with Split, featuring James McAvoy. The latter dropped the bomb at the end of being in a connected universe, since that was all the rage at the time (I remain unconvinced that this was anything but a last minute shoehorned decision with an easy take-back if it didn't pan out). In Glass, we're focused on Samuel L. Jackson's mastermind character first introduced in Unbreakable, who has designs on revealing to the world that super-powered people exist, first with Willis' near-invulnerable David Dunn, and next with McAvoy's multiple personalities, one of whom takes on super-human abilities in the form of The Beast. Locked together in a mental institution, Mr. Glass attempts to force the issue by forcibly unleashing McAvoy's most destructive personality, breaking them both out, with Willis sure to follow to save the day. Both Unbreakable and Split were surprises in their own way – with viewers not really aware that they were actually watching a comic book film for the first (and this, in the time before that was an established and workable genre of film) with Split's connection to it only revealed in an end credit sequence. For a director known for his twists, this may be the ultimate twist of all. 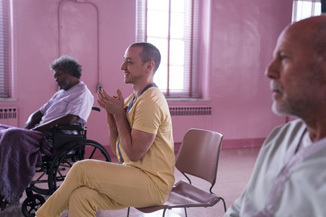 Glass assumes that we all want to see this connected together and concluded and well... Shyamalan might not be wrong about this. It's a bold move for a guy who's made bold moves through his career, both for good and bad.